But the cartoons that are probably best remembered for the practice are Jay Ward's Fractured Fairy Tales. 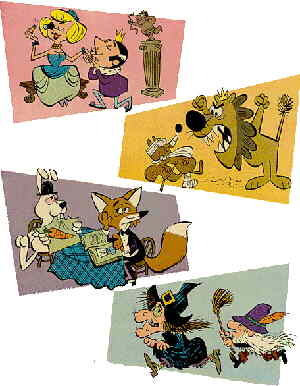 The series debuted in 1959, as a back-up segment to Rocky & His Friends on ABC. 91 episodes were made, each 4½ minutes long. One of the few TV cartoon series with no continuing characters, it was done in the style of a repertory company, with the same acting troupe playing a different set of roles each time. Voices repeatedly heard were those of Daws Butler (Cap'n Crunch, Quick Draw McGraw), Paul Frees (Ludwig von Drake, Dinky Duck), Bill Scott (Bullwinkle, George of the Jungle) and June Foray (Granny from Tweety & Sylvester, most of the female characters in Peabody's Improbable History). The narrator was character actor Edward Everett Horton. Rocky & His Friends lasted two years on ABC, then was picked up by NBC, under the name The Bullwinkle Show. The back-up segments were picked up with it. In 1964, most of those same segments, including Fractured Fairy Tales, became part of The Hoppity Hooper Show. In 1969, they were repackaged again as part of Dudley Do-Right's short-lived fling as a lead character. Fractured Fairy Tales wasn't a cross-media phenom — no big little books, no Little Golden Books, and only one comic book, published by Gold Key in 1962 (in which cartoonist Mel Crawford (Prof. Harbinger, Santa Claus Funnies) adapted actual episodes into comic book form). But it's had plenty of TV exposure in all the shows it's been part of and their endless reruns. And like most Jay Ward productions, it still has legions of fans.